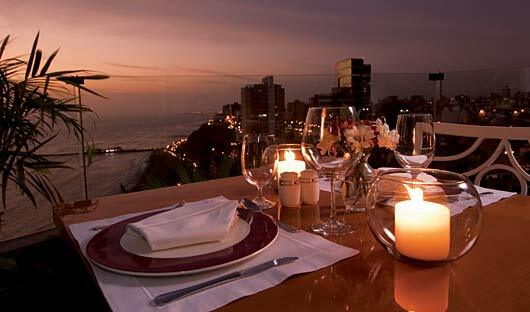 When thinking of luxury and fine dining, not many people consider Peru. However, along with several world-leading restaurants, Peru is home to many fine hotels, excellent rain-forest lodges, luxury river cruise boats and beautiful lodges. Impeccable service compliments the high standard of accommodation. Peru’s Andean cultures, from the coast, to the rain-forest and into the Andes are well represented in these properties. Many are former colonial homes, monasteries or convents which have been exquisitely transformed into luxury or boutique accommodation. Luxury and culture perfectly intertwine throughout these magnificent properties. Peru is also home to a luxury train service from Cuzco to Machu Picchu and through to Lake Titicaca. Peru, in particular Lima, has become home to many fine restaurants; two in the world’s top ten and nine of Latin America’s top fifty gourmet dining experiences are found here. 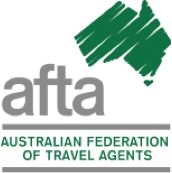 Many of the properties throughout the country are quite small and book out 12 months, or more, in advance. 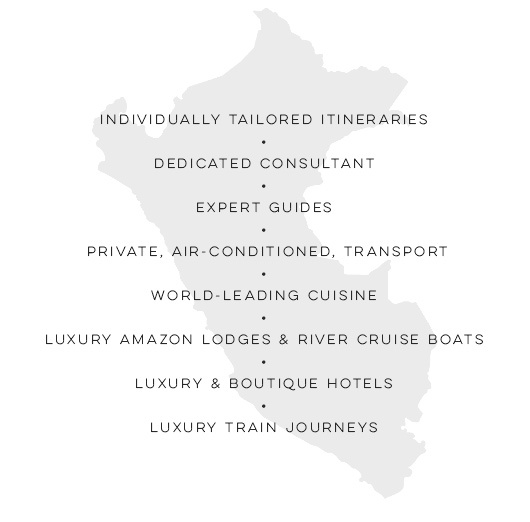 If you want a perfect individually tailored Peru itinerary, featuring luxurious and unforgettable accommodations and private air conditioned transport, please call our dedicated experts as soon as possible. Balancing elegance and sophistication, Belmond Miraflores Park in Lima is bound to impress even the most seasoned of luxury travellers. The 11-storey property could easily be considered one of Lima’s finest luxury hotels. Unwind in the cocktail bar, enjoy a sunset from the heated lap pool boasting views of the Malecón, the park-lined avenue that hug’s Lima’s coastline or eat a delicious meal at the hotel’s restaurant. All common areas in the Belmond boast the same signature ocean view giving the hotel an air of relaxation whilst also blending granduer and luxury. The four different types of suites will delight it’s guests with space to relax, unwind and take in the magnificence of their surroundings. 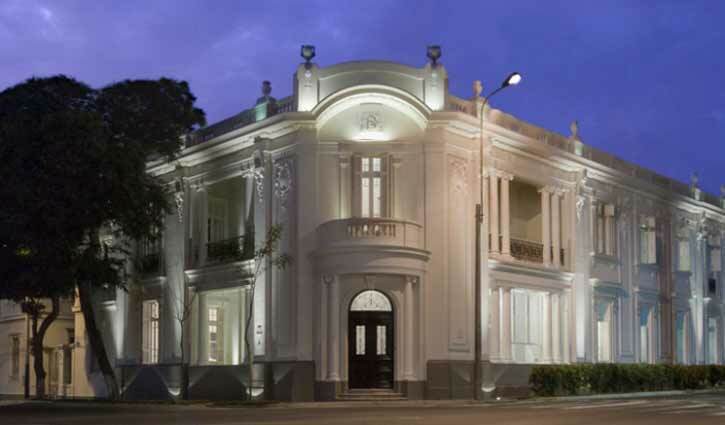 Rich in history, The Hotel B was originally built in 1914 as a private residence in the heart of the Barranco district. It was meticulously restored over two years, being sure to preserve the opulence and glamour of the Belle Époque period during which it was constructed. Featuring 17 guest rooms, the beautiful building with a crisp white facade is next to the Pacific Ocean in the bohemian-revival neighbourhood of Barranco. The surrounding area of Hotel B is complemented with historic houses- architecturally reflective of the time that they were built in, boutiques and high-class restaurants, including their own signature one. The hotel features its very own art collection curated by an adjacent highly regarded gallery. A stay at Hotel B is bound to have you feeling a part of the very special Belle Époque period in which it pays homage too. 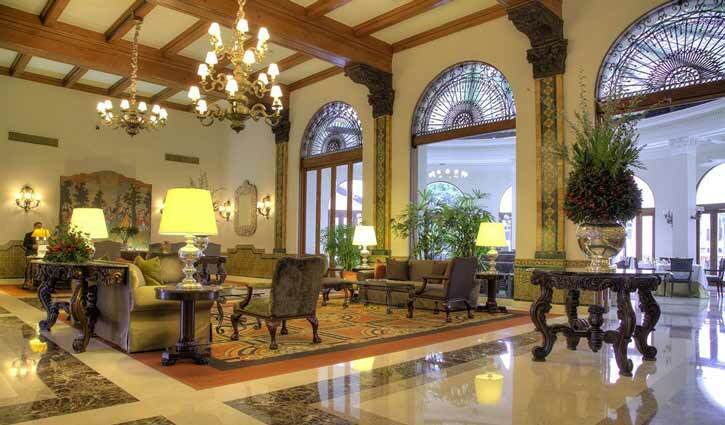 Exclusivity and elegance go hand in hand during a stay at the Country Club Lima Hotel. Dating back to the 1920’s, with many different icons and celebrities gracing the property with their presence, a stay here is set to make you feel like you are living in a part of its history. The glamorous rooms combine art and luxury to reward their guests with the perfect place to lay their heads. Each featuring tapestries, exclusive works of arts and the highest quality of linens and feathers making for a beyond comfortable stay. With three Gastronomic experiences on the property, a swimming pool, spa and sports area you may never want to leave during your time at this absolutely unforgettable accommodation option. Pristine, remote and full of ode’s to its unique location, Inkaterra Reserva Amazonica is set to wow any one of its visitors. Deep in the heart of the Amazon Jungle on a private rainforest reserve, this lodge features 35 unique thatched and lantern lit cabanas inspired by the traditional Ese’Eja indigenous culture. The property boasts an opulent two story building with a comfortable lounge and dining room. Upstairs big balconies reward it’s guests with sweeping views overlooking the Madre de Dios River and the surrounding forest. 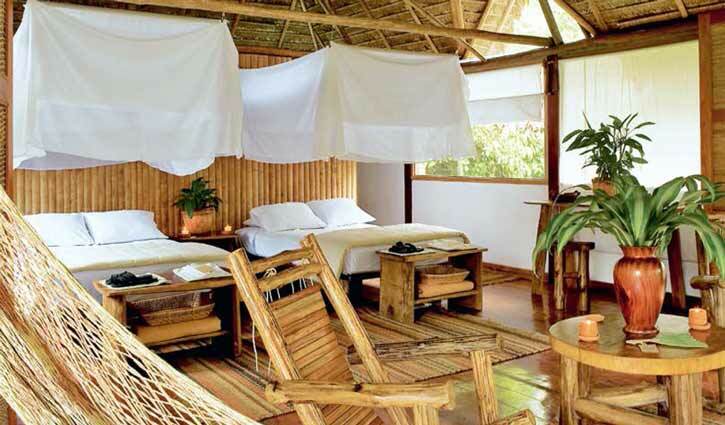 In 2013 National Geographic Traveler magazine acknowledged the unique property as one of the top 25 Eco-lodges in the world. The 42,008 acre private ecological reserve in it’s untouched, isolated location is still easily accessible for it’s guests. A stay here is set to reconnect you with nature in it’s rarest form with up to 540 species of bird recorded here. 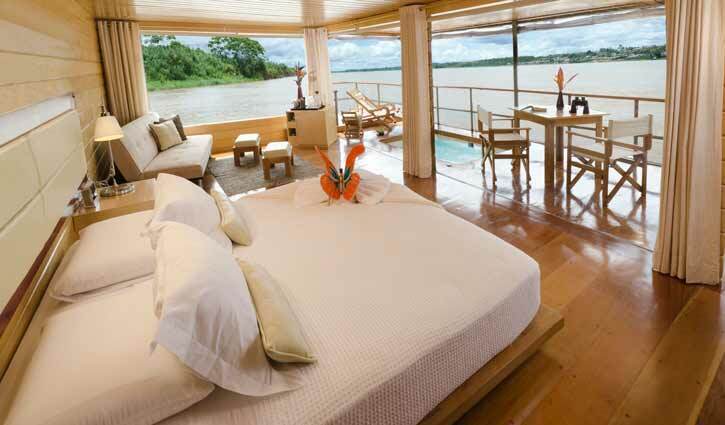 Cruise along one of the earth’s mightiest rivers — the Amazon, in one of the most luxurious vessels- the Aria. Of all the regions of tropical rainforest existing in the world, the Amazon Jungle is one of the greatest wild places left on earth. The Aria, a 45 metre-long modern expedition cruiser launched in 2011 has a capacity for 32 guests. With 16 spacious guest suites on two decks, each external with floor-to-ceiling windows, and four suites that are interconnected to cater to families. All suites are air-conditioned with a king-sized bed (that can be converted to large twin beds), an en suite sitting area, and a well-appointed private bathroom with hot water available around the clock. Guests can choose to socialise in the dining room, the indoor bar and lounge, on the observation deck and in the outdoor lounge. Originally built in 1978, the ‘Delfin I’ was completely reconstructed in 2010 and remodelled in an upscale contemporary style. A deluxe 20m-long expedition vessel whose design is based on the traditional Amazon riverboat with modern features, it is built using tropical woods and displays a chic décor throughout. Carrying only 8 passengers in four stylishly furnished and very comfortable, large air-conditioned suites – 2 Master Suites and 2 Deluxe Master Suites. 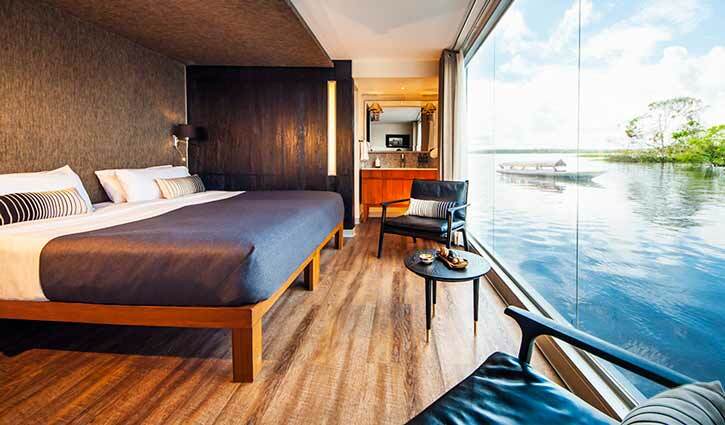 Each has a king-size bed (can be converted to twin beds), an en-suite bathroom, panoramic windows and a private deck. The Deluxe Master Suite also boasts a private jacuzzi on its deck. The upper observation deck, with its open sides, cushioned sofas and reclining chairs, provides the perfect relaxation area as you cruise along the river. Meals are prepared by a locally renowned chef and feature the exotic flavours of regional specialties, served in a contemporary wood-panelled dining room. 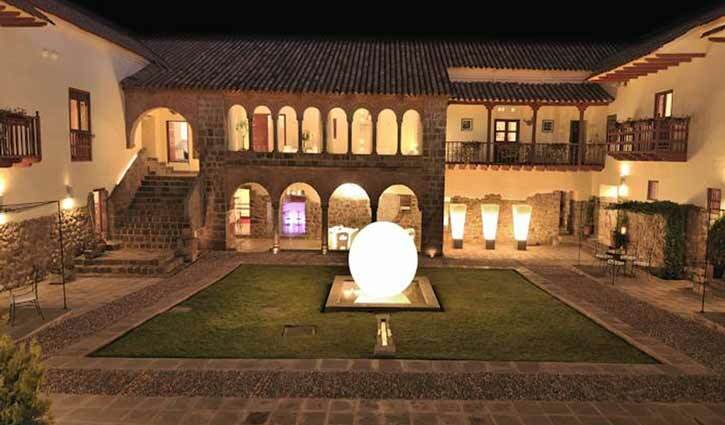 As the first boutique hotel in Cusco, Inkaterra Las Casona paved the way for luxury properties in the region. Residing in a 16th Century manor house, on the training grounds for an army of elite Incas, history and sophistication are abundant here. Spread around a main patio, the 11 suites all feature colonial furniture, original murals, Pre-Columbian textiles, chimneys, heated floors and extra-large bathtubs. There is also a private spa, reading lounge and outdoor terraces exclusive to the guests of the property. The elegant property is situated on Las Nazarenas Square, a relaxing oasis between Cusco’s main plaza and the San Blas artist district. 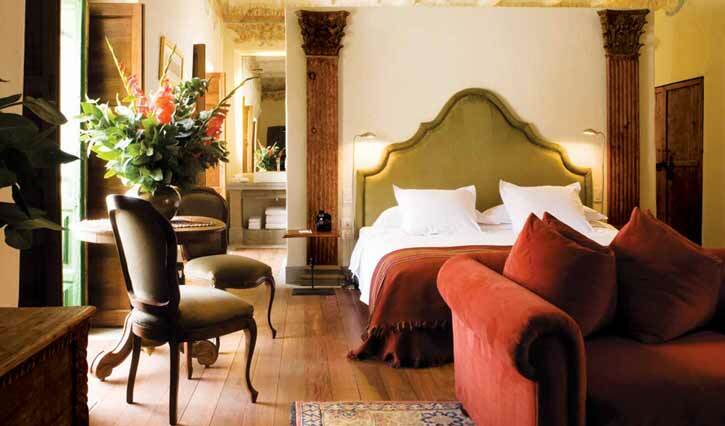 The Belmond Palacio Nazarenas is reminiscent of a fairy-tale in the heart of Cusco. Once you make your way through the carefully restored Inca walls, prepared to be in awe of the properties ability to effortlessly combine history with modern luxury. The 55 suites are oxygen enriched to help with Cusco’s elevation, delicately decorated with marble bathrooms with underfloor heating, an in-room bar, an on-call butler and have a mountain, garden or courtyard view. 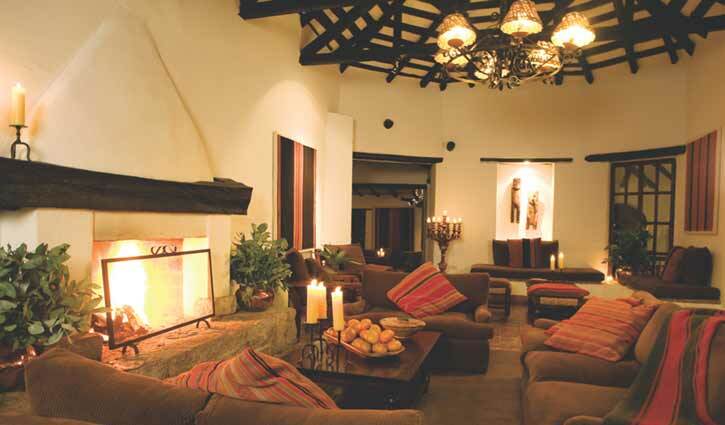 Full of character, the hotel features Cusco’s first outdoor heated pool, a library, secret garden and guest lounge. This intimate urban retreat pays homage to Cusco’s history whilst rewarding it’s guests with timeless luxury and impeccable service. 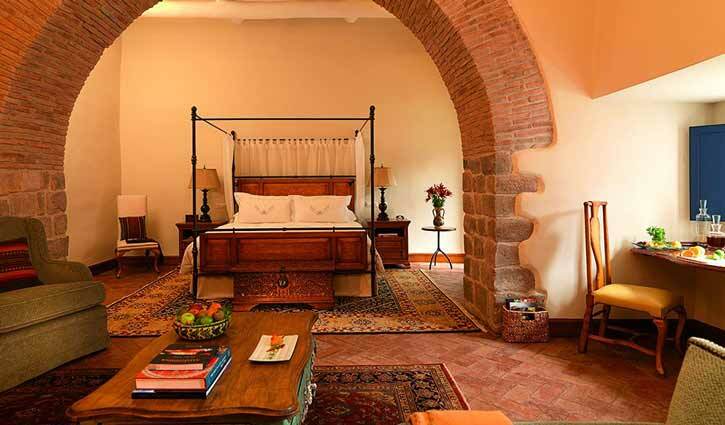 With only 16 exclusive suites, Casa Cartegena is an intimate refuge in the city of Cusco. Declared an UNESCO world heritage site, the Boutique Hotel has been magnificently restored giving it’s guests ample insight into what life was once like throughout these historical walls. All suites home designer furnishings with wood, leather and natural fabric finishing’s. With butler service available along with a spa and gym on the property, Casa Cartegena is the perfect place to unwind after a busy day exploring the historical city in the heights of the Peruvian Andes, Cusco. 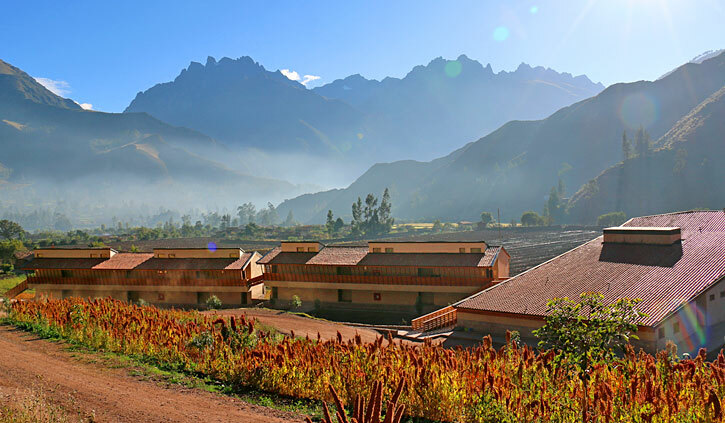 Surrounded by mountains on a remote farm, explora Sacred Valley is located between Cusco and Machu Picchu, positioning itself as a perfect base to explore this highly coveted area. explora’s architechural design speaks simplicity and luxury. With its primarily wood and stone appearance, well planned communal areas and 50 simple, stunning and minimalist rooms, a stay here is bound to impress and help you to disconnect from your usual routine and connect with your breathtaking surrounds. There are an abundance of excursions for any and all fitness levels along with passionate and professional guides with an in-depth knowledge of the local area. Tucked away among a cloud forest, Inkaterra Machu Picchu Pueblo Hotel is an intimate Andean village with rolling, terraced hills, enchanted waterfalls and stone pathways. These lead guests to the 83 whitewashed adobe casitas fit for royalty. Thoughtfully designed with it’s surroundings in mind, the hotel is a true testament to the beauty of the land on which it resides. Complete with a large glass house constructed as the restaurant, with adjacent terraces it boasts privileged views of the Vilcanota River and lush green mountains. An onsite spa offers you many different forms of relaxation and the staff members attentiveness and knowledge of the surrounding area is astounding. 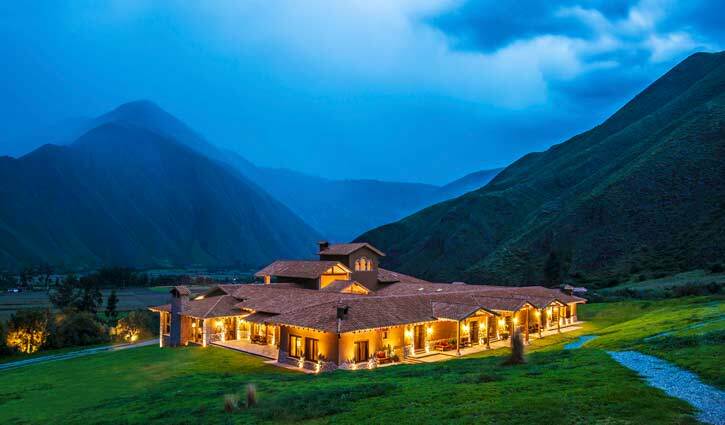 Spanning across 100 acres of beautiful green mountains in the countryside, Inkaterra Hacienda Urubamba is a stunning contemporary hotel. Situated in the Sacred Valley of the Incas, all 12 rooms in the Casa Hacienda and 24- stand alone luxury Casitas provide a welcomed sanctuary for its guests with simply breathtaking views. With architecture and interiors inspired by local culture it quickly charms you with its beauty. What makes Hacienda Urubamba so special is the Earth to Table concept where guests are able to pick their own produce from the hotel’s very own 10-acre organic plantation. 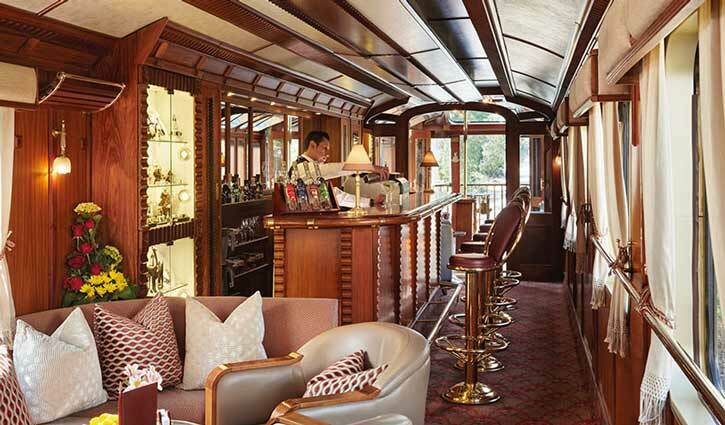 A ride on-board the Belmond Hiram Bingham train allows its guests to immerse themselves in 1920’s-style luxury carriages constructed with polished wood, antique fittings and brass finishing’s. Named after the explorer who rediscovered the Inca citadel, the train is bound to take you on an unforgettable ride. Journey through the Inca Empire from Cusco to Machu Picchu in elegance and style whilst watching the rolling hills and starry nights from your carriage or the observation car. Eat like royalty during this unique South American dining experience, as you glide through the Andes whilst indulging on local artisinal delights. You will stay at luxurious, five star Belmond properties along your journey onboard the Hiram Bingham train. 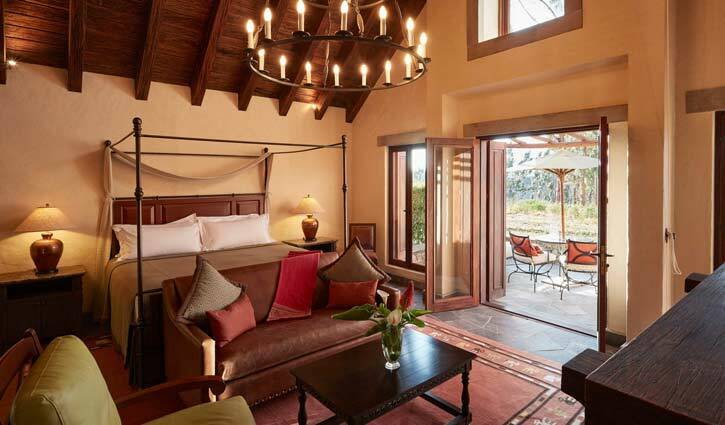 Located on the shores of Lake Titicaca, on a secluded private peninsula, Titilaka Lodge is undeniably luxurious. The all inclusive lodge provides its guests with magnificent dining, breathtaking views, contemporary design and second to none service. It’s understated exterior and remote location add to the ambiance of this boutique accommodation. 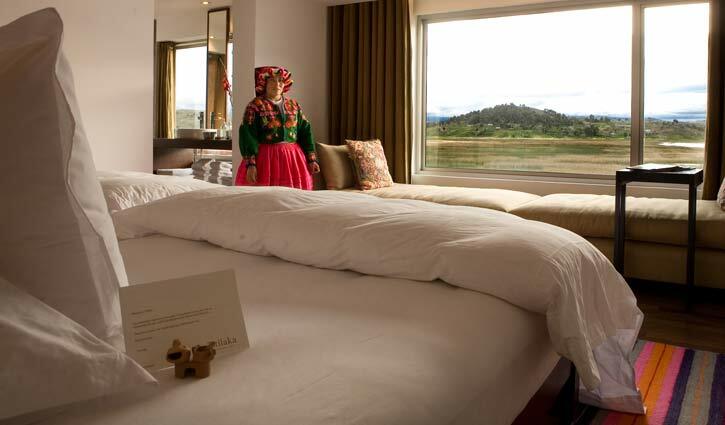 The 18 Dawn and Dusk suites, Corner Room and King Room have all the amenities of an elegant room with heated flooring, over sized tubs, massage showers and the chance to witness either sunset or sunrise over the beautiful Lake Titicaca. 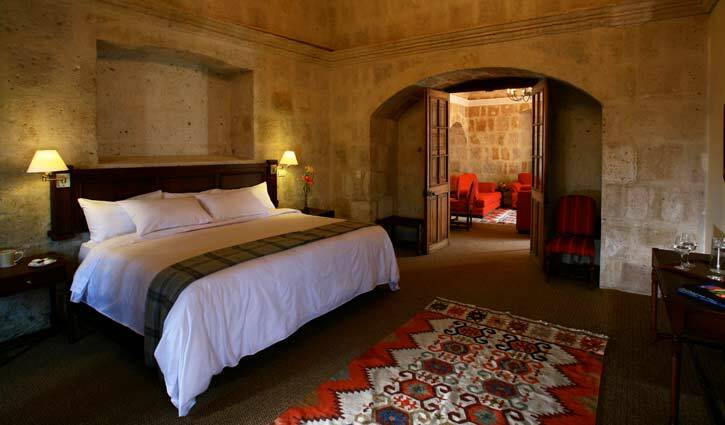 Casa Andina Arequipa features an impressive historical lobby, with a modern extension to house 40 highly comfortable rooms in a convenient location. The hotel is built on the old Mint, constructed in 1794 which is considered a national historical monument. The property features the Alma Bar, a sauna and spa to relax in after a busy day, and a restaurant serving delectable foods. Nestled in the hills of the highly coveted Colca Canyon, Belmond Las Casitas offers a sanctuary surrounded by the serene natural environment. Featuring 20 individual casitas, all complete with a terrace and hot tub for guests to relax and unwind after a day exploring the Peruvian countryside. An ultimate retreat of the region, the property has a swimming pool with stunning views of the Andean terraces, a library, vegetable garden and a small farm. The hotel features the Curiña restaurant, a highly coveted dining experience serving traditional meals with a vast array of ingredients, some taken straight from their farm. Consistent across all Belmond properties is luxury and impeccable service, Las Casitas is certainly no exception. 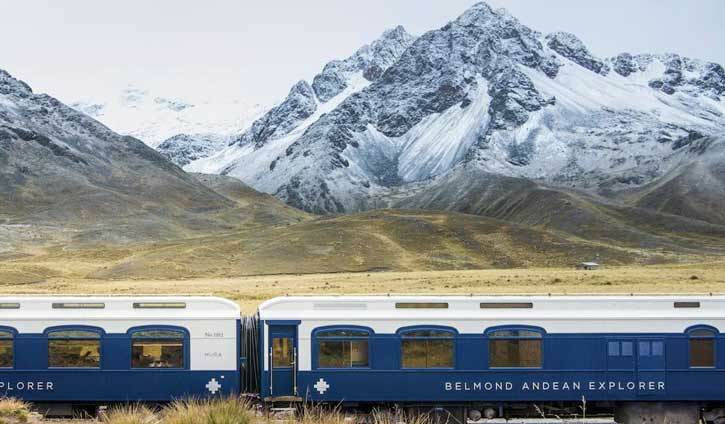 As South America’s first luxury sleeper train, the Belmond Andean Explorer winds it’s way along one of the world’s highest rail routes with elegance and ease. The contemporary aesthetic combined with Peruvian inspired finishing’s create an unforgettable experience for those on-board. All cabins are equipped with an ensuite bathroom, a wardrobe, oxygen tanks and masks (for the high altitude) and are effortlessly stylish. As the Andean Explorer snakes its way through the Andes, to some of the best highlights of Peru, it rewards its guests with breathtaking views and unparalleled comfort. A full spectrum of Peruvian cuisine can be enjoyed throughout your journey made by highly acclaimed chefs. Who says luxury and adventure can’t go hand in hand? Immerse yourself in an abundance of nature and the local Chachapoya culture whilst experiencing breathtaking views of the Utucamba Valley. Stay in one of the four delightful bungalows all featuring sleek design and furnishings reflective of the surrounding area. 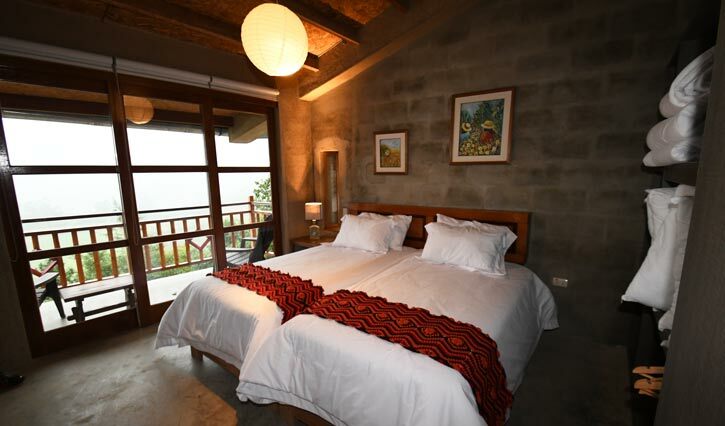 Ranga Wasi is located in San Miguel, 2400m above sea level, enabling it’s guest to be immersed in the tropical cloud forest. Rich in wildlife and flora and fauna it is the perfect place to relax by the fireplace in the common room and unwind without skipping on lifes little luxuries. 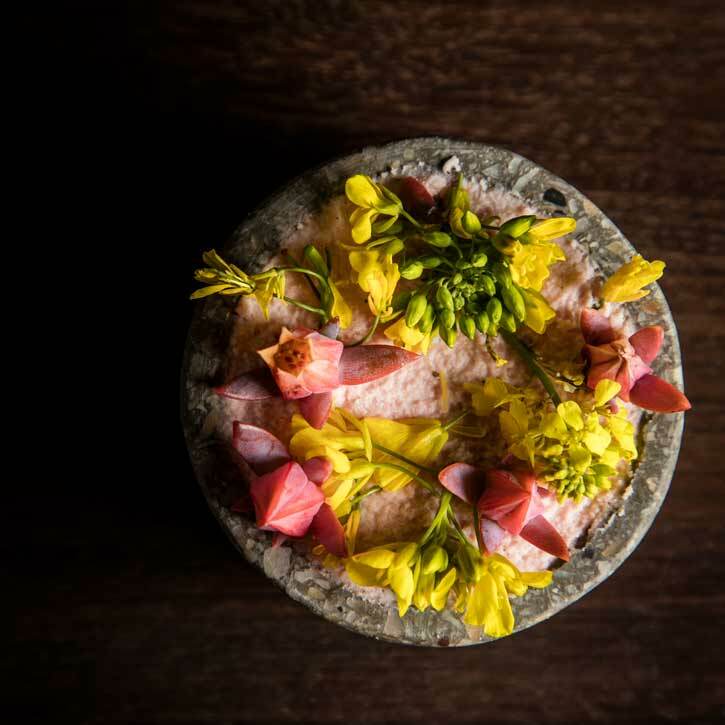 Lima is one of the world’s culinary hot-spots, with two of the World’s best (Central #6 and Maido #7) restaurants and nine of the top fifty in Latin America. MAIDO (#1), CENTRAL (#2), ASTRID Y GASTON (#8) , ISOLINA (#13), RAFAEL (#16), LA MAR (#17), OSSO (#25), MALABAR (#39) & AMAZ (#48). The dining experiences are incredibly varied. Some, like Central, take you on a journey from the coast to the Andes through a beautifully presented degustation menu. Others, like Maido, offer a fusion of Peruvian and Japanese cuisine. The fabulous thing about all of this is that restaurant standards and chefs, have increased throughout Peru; in Cuzco, Arequipa and on Amazon river boats. The owner and head chef of Central Virgilio Martínez Véliz has opened a restaurant called MIL in Maras, approximately 45 minutes from Cuzco. So wherever you travel in Peru wonderful cuisine awaits you. Please allow us to make a reservation for you, as these restaurants are not only famous, they are very busy with local as well as international guests.